Aftergraduating from Western Michigan University with a degree in televisionproduction, he got his first taste of comedy when a friend dared him to tryhis luck onstage. Shortly after, Allen was doing stand-up at night, while supplementing his income by acting in commercials. By 1990, Allen's "Men Are Pigs"routine, which focused on the male love for hardware, was made into aShowtime television special. The segment caught the attention of DisneyStudios chairman Jeffrey Katzenberg and Walt Disney CEO Michael Eisner, andAllen persuaded them to use his routine as the basis for a new sitcom-HomeImprovement. Before the 1991 debut of Home Improvement, Allen made headlines byrevealing that he had served time in prison from 1980 to 1983 forpossession and distribution of narcotics. 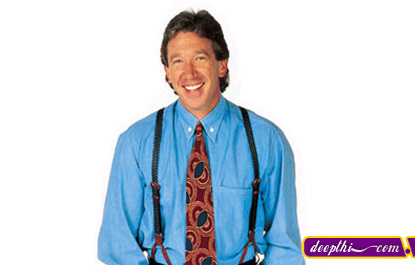 However, his controversial admittance failed to affect the popularity of Home Improvement, which made the Nielsen top ten list during its first season. The sitcomhad a successful run through the 1998-99 season, while Allen was paid an impressive $1.25 million per episode. In addition to his TV work, Allen wrote two commerciallysuccessful books, Don't Stand Too Close to a Naked Man (1994) and I'm NotReally Here (1996). He has also seen success on the silver screen starringin The Santa Clause (1994) and lending his voice to Buzz Lightyear in theextremely popular Toy Story (1994). Upcoming film projects include two new Santa movies and a starring role as Jim Anderson in a big-screen version of the 1950s sitcom Father Knows Best.